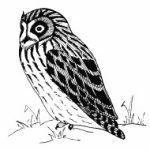 States, including Washington state, Short-eared Owl populations are in decline due to encroaching development and changing agricultural practices that threaten its natural habitat. In our region, Short-eared Owls are occasionally seen in remnants of native Palouse prairie and in fallow fields during their spring and fall migrations. They may also be found in winter, if snow depths are shallow and vole populations high.